Guests plan on spending an average of $146 on wedding gifts this year, according to a recent survey by Ebates.ca. While this budget leaves room for great gifts, many would agree that the struggle is real when it comes to figuring out what to get the couple that has everything. Nowadays, most couples are living together before they get married and have all of the starter home items that they could possibly need. So what do you get for the couple that has it all? Here are six fun ideas that will surely gain you brownie points with the bride and groom. According to the Ebates.ca survey, 36 per cent of Canadians prefer to receive cash as a wedding gift. 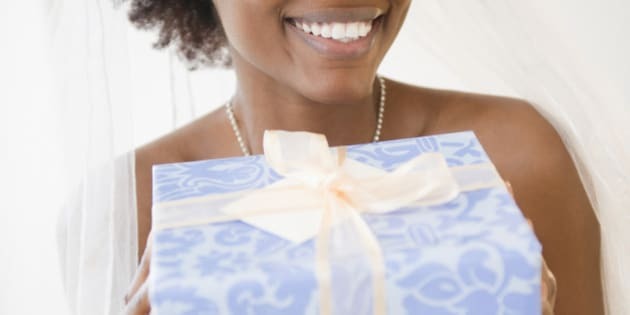 While this may not strike you as the most thoughtful gift, money may be helpful to a newly married couple who may have a few post-wedding bills to pay. Make your gift of cash extra thoughtful with a personalized wedding card that you can find online from designers online. Make the couple's honeymoon more memorable by purchasing them an experience that can be used on a trip. Think bamboo river rafting or zip lining if they're traveling to Thailand, or purchasing a gift certificate at a high-end hotel or restaurant chain so it can be used wherever they travel. Personalized or monogrammed wedding gifts make for creative and thoughtful gifts ideas that will stand out in a sea of serving platters and glassware. Etsy, for example, has an eclectic selection of personalized wedding gift items, from monogrammed cutting boards and steak knife sets to personalized key holder racks. You can achieve this by treating them to a night out to a gourmet restaurant, where they can order whatever they like without worrying about the bill. Think mini-staycation, gift cards to a nights stay in a boutique hotel -- unique experiential gift ideas will certainly be appreciated. When returning from the honeymoon or if the couple is staying after the wedding, think of creating a deluxe custom-built gift basket! Add some great snacks & sweets, movie passes, voucher for a hotel stay, gift cards, a bottle of wine, and a hand-written note with some words of advice. The customization will really add a special touch to the gift and all the goodies will be more than welcome to help unwind after all the stressful wedding planning. Subscription boxes are the latest craze and there's one for just about everyone! You could sign up the couple for a joint box that they could both enjoy or sign them up for their own boxes for how many months fit in your budget! For the groom; how about a sock subscription box? For the bride, there are so many options available! From beauty to clothing and jewellery, you're sure to find something that suits her personality! Not only is this a great gift idea but it also continues to surprise them for months to come!